The world’s biggest and best software companies tend to have smaller ACV’s. 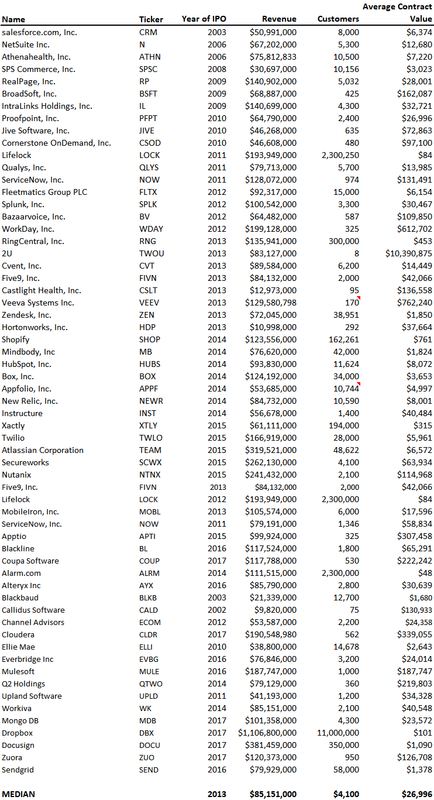 Below is a data set of 61 publicly traded SaaS companies and their estimated ACV’s at exit/when they went public. To do the analysis, we looked at each Company’s financials before going public and compared their annual revenue to the number of customers at the end of the year. Upon going public/exiting, the median ACV was only $26,996. This makes sense as the universe of companies that can afford a lower ACV is much higher than those that can afford a $50,000+ ACV so by focusing on a lower ACV, you can grow into a bigger company and exit faster. Increases in ACV aren’t free. Usually in order to increase ACV, it means some other metric of importance gets worse, for instance the sales cycle gets longer, the close ratio comes down, and the number of leads needed to complete a sale increase. In order to achieve higher ACV’s, you have to focus on larger clients which inevitably means more layers of management for approval, more time required to identify the decision maker, more layers of bureaucracy to fight through, etc. Salesforce’s pricing should be looked at as the standard. For enterprise customers, Salesforce has packages that are $25, $75, $150, and $300 per user per month. Salesforce’s most popular package is the $150 per user tier, so your product needs to be priced well within this tier, because many buyers will look to Salesforce as the cap: “why would we pay $X per user for your product when Salesforce is costing us $150 per user” is a common question we see in our own portfolio. To maximize growth, we find that ACV needs to be well below the $150 per user mark. By the way, Salesforce’s median ACV at exit was $6,374. ACV is a metric that should be monitored, but don’t change the way you sell in order to artificially increase it. While metrics like ACV are valuable, the real metrics you should be focused on are revenue and cash flow, and ACV is only one of many ways to impact both.